Finally the beautiful New England weather is here! 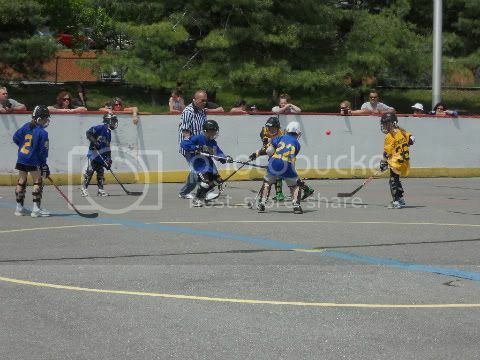 It was so nice to watch my son's street hockey game outside and enjoy a perfectly sunny day. 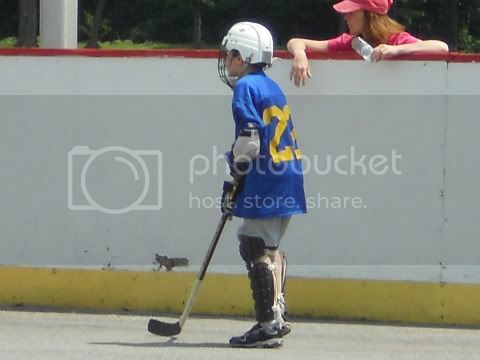 This is the first year that my eight-year-old son James (#22)decided to try street hockey. 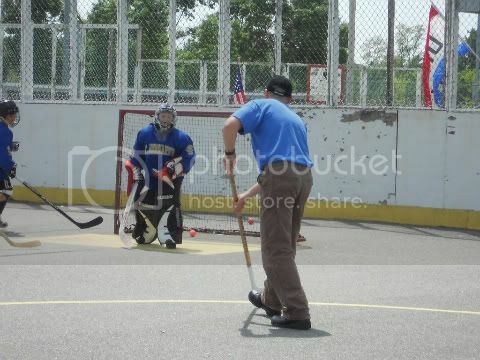 I remember playing street hockey in high school gym class and I loved it. I was pretty athletic way back then and dare-I-say a little aggressive! I remember constantly running after that ball with more intensity that a dog - banging into sticks and classmates along the way. My son James (although still young) is not quite as aggressive or intense, and as a matter of fact, he couldn't be more thrilled that he will play his last game on Wednesday. Here's the thing. The coaches do a lot of yelling and my sensitive guy is well.....sensitive, so the yelling was the deal breaker. Here are some pics. of Saturday's game. His team (Saint Bernard's Saints) won 5-3. It was a great game. Hello? 22? Where did that darn ball go? Notice the ball in mid-air and not one player appears to know where it is. Okay, I suppose those helmets do make it a little difficult to see the bright orange ball. That poor goalie looked like he was dressed for a snowstorm and it was about eighty degrees. (I'll bet he is glad that Wednesday is the last game too.) Even Dad (Grant) helped out and did a little assistant coaching. A first! I am so glad that I found Amy's blog Just Another Manic Momday. She has this great linky called Meet-Up Monday's. Here is her Meet-Up Monday's button. Go link up and check out some great blogs! 2. Leave a comment on the blog above your name in the list. 3. Visit as many blogs as you can and leave comments and follow if you like. I am visiting and following you from Meetup Mondays! Hi there! You stopped by my blog recently and I thought I'd stop by and say hello to you too :) Now following! Hi..I love your blog!! I am from Blog following network on Twitter Moms.